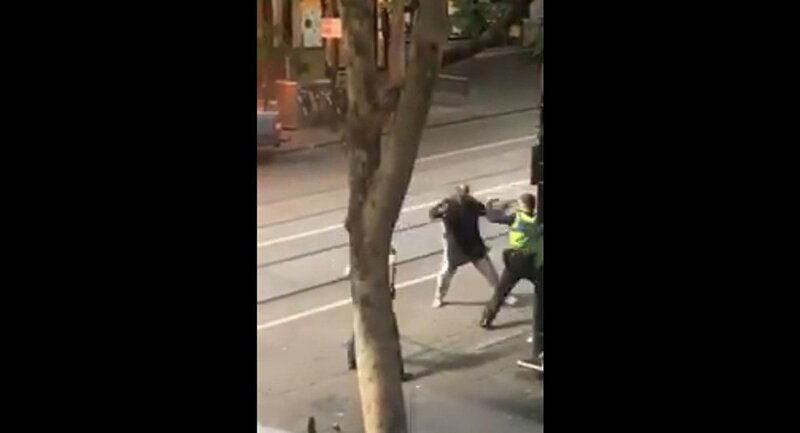 Onlookers have caught on camera a confrontation between a man and police officers in Melbourne. The suspect was gunned down after attempting to stab the cops with an unknown weapon that appears to be a knife. The clip opens with a car bursting into flames while the suspect tries to attack a group of policemen, before one of them opens fire. A man wielding a shopping cart can be seen trying to help the police. — mike yang (@fayfayang) 9 ноября 2018 г. The suspect has been taken to hospital in a critical condition. Local media report that prior to the skirmish, the suspect set his own car on fire near the intersection of Bourke Street and Swanston Street, a thoroughfare in the city centre. According to Melbourne officials, a number of people are being treated for stab wounds. — Jack Lovel (@jalovel) 9 ноября 2018 г.